Babiones say most of their customers are working cowboys who need boots that fit properly and are built for all-day, every day work. Courtesy photo. Virgil and Paula Babione are carrying on a tradition of making boots that fit. 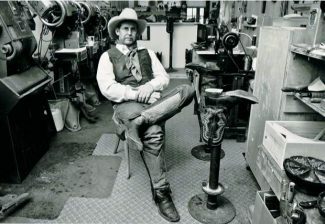 Wilson Boots was started in 1945 by Carl Wilson, a saddlemaker in Miles City, Montana. The business was passed on to an employee in 1968, and in 2013, Babiones cashed in their retirement savings and bought the business. "Either we make it, or we're on the street," Paula said. The business is now called Babione's Wilson Boots Emporium and it's located off I-90 exit 333 in Livingston, Montana. The store carries Western wear, leather care items, silk scarves, Wyoming Traders clothing, Bronco Sue custom hats and Sunbody hats. They also carry U.S.-made Geier gloves and the Prison Blues clothing line, which is made in the Oregon penitentiary. Their main business, though, is custom boots. Every pair of boots starts with a custom last, the form around which the boot is shaped. Virgil begins with a standard last, then after taking measurements and drawings of the customer's foot, builds the last to look like the foot. "If you have bunions, hammertoe, all kinds of foot problems, or big calves and can't wear traditional boots, we can make adjustments for that," Paula said. "You can have basically anything you can dream up as far as a boot goes." Babiones have sent boots all over the world, but they say it's easier to make sure the fit is right when the customer can come to the store. "Sometimes it's a little risky when they do the tracings themselves, because they don't always follow the instructions correctly, but we work with them until we get it right. We stand behind our product." And as a working cowboy who has worn Wilson custom boots for 32 years, Virgil also spent a lot of time standing on their product. 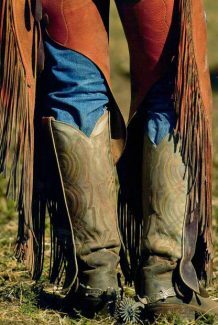 He had worked with leather all his life, building saddles and tack, but boots were a whole new ballgame. "But it's just another form of working with leather," Paula said. The fit and quality are the distinguishing factors in custom boots, which have a starting price tag of $625. "We have customers who've had the same pair of boots for 30 years," Paula said. "You get what you pay for." Wilson Boots have an inner sole, midsole and outsole, so the sole is very thick. A 3-inch steel shank provides arch support. "We've had people who have never had a boot like this in their entire life and they say, 'I didn't know this was the way a boot is supposed to feel.'" Their primary customer base is working cowboys, because they know their boots are an important investment. Virgil builds all the lasts, but only a small portion of the boots are built start-to-finish in the Montana store. The rest are sent to a factory in El Paso, where they are still completely custom-built. Paula said Montana tax laws make it difficult for them to hire employees to build boots locally because they are in a high-risk tax category. Right now they're at about a 16-week waiting period for a pair of custom boots. Gift certificates are available in any amount. You can reach them at (406) 222-3842 or online at http://www.wilsonboots.com.